facebook is gobbling up the energy/thoughts I would otherwise expiate here. but abbreviated and at the mercies of a larger and less self-selected/sympathetic audience than voxdom, and so I question the wisdom of this time/energy use. I've been up since approximately 2 (it being now 5:18) at which time the feller came to bed and showed me all the pimping he'd done to my cell phone. with which I take fewer and worse photos than I did with the lower-end LG, which irks me. I'm definitively not in michigan, where I thought I'd be right about now, probably still driving– visit determined not needed, so fine– I'm here, but not really ready to be here, having thought I'd be there– not ready to go to work today, having thought I'd be taking it off, and yesterday being such a dreadful headcase making me want to avoid the site of such uncenteredness entirely. among the million things, was called a "cyber stalker", meant in jest almost surely, tho it stings since I'm such a watcher-wallflower and have loathed it for years, dreading those moments when my well-intentioned gaze is unwanted and garners tiny smackdowns– this tag, I should mention, in the context of fb public wall posts, so the truth of the suggestion clearly compromised, but still. the suggestion of it stinging. hahahahahahahaha: all that I cannot say in fb space and that clangs around the cranium in odd hours. and so I purge it here. and you, if you are reading this, oh lord tread lightly– lack of sleep and judgment no doubt induces overmuch sharing of insecurity insanities. and now back to bed, to breathe the air of puppy and fella and try to calm and sleep at least a smidge unto this undesired workday. I will find myself tossing, one side, then the other side, this position and then another, drifting off, dozing, only to jerk awake with a sharp intake of breath at some shapeless dreaming anxiety. who knows what parts it's due to, thirsty, having to pee, distracted by a change in the weather, blinds slapping against open windowframes– but eventually I will quit fighting it, wake up, rise, wander the mostly-dark apartment aimlessly, picking up small things here and there, a glass, a plate moved from table to sink, stand staring in a doorway, wrap myself in a throw blanket and sink down on the couch, lie gazing up at moving shadows of tree branches cast across the wall by streetlights, listen to the base thump of a passing car or some random walker's laughter in the night… I think, ultimately, it has to do with the acute sense of life passing, simply and inevitably, right this instant, then this one, and the next, each and every and all of them leafing away and sinking without trace into the well of time– and the overwhelming urge, desperation really, to do something, whatever, meaningful, resonant, actual, I don't know, just something that makes sense, that serves to tie those passing instants together, to weave them into a thread, wind that towline, and gradually drag myself back up from the vanished depths. 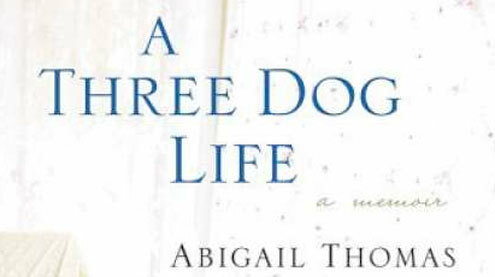 another fine book with “dog” in the title (no mystery why these jump off the shelf at me): a three dog life by abigail thomas– memoir most gracefully arranged. my head is full of shards that poke me awake at three and four a.m.– at which point I’ll get out of bed, fed up with it, meander aimlessly from bathroom to kitchen, alight on the couch and sit staring, full of unreconcilable noise, simply fraught in the dark, until eventually exhaustion wins out and back to bed. saturday we spent entirely out, unusual for habitual homebodies– downtown among the shamrock throng– we pursued our own parallel and unrelated course from cell phone store to lunch to art museum to secondhand shops to bar and so on, weaving through and among all those drunken costumed babies– girls crying into cell phones, boys hollering, singing, peeing in doorways– loud and incidental to our own daylong adventure. 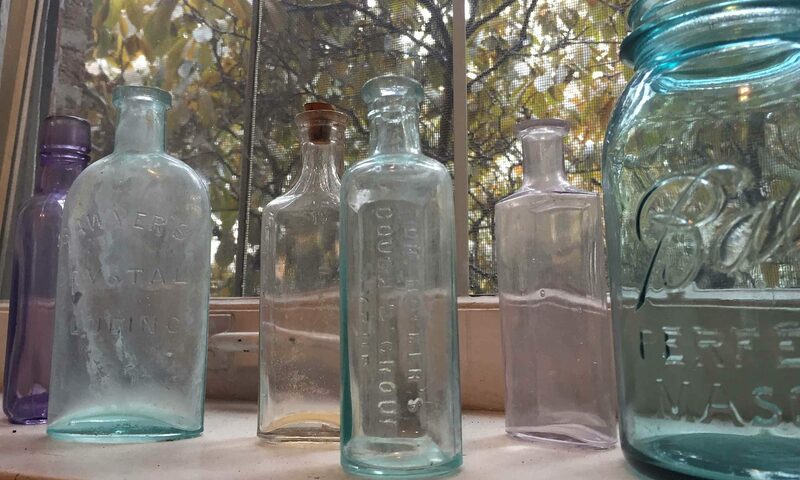 we’ve decided to stay put for now, though spring is tweaking me– it’s the good choice, pull ourselves together in all the right ways for planned rather than haphazard forward momentum. practicing patience is uncomfortable. my mind hounds itself with buts and ifs, and it’s difficult to keep still and steady. my heart craves large, marked and decisive gestures, but is unable or unwilling to settle on a single direction for momentum and so thrashes against itself, pushing this way and that until it’s simply worn out. the time has changed, so days are brighter and seem longer, which lifts my mood across the board– regardless the prospect of another year confounds. so I decided I wanted to photoshop up a spiffy little “Embassador of Vox” sash for karen, just, yknow, because it’s so her (and, uh, yeah, this is the sort of thing I do at 3 a.m.). and now I do have to go to sleep before my brain implodes. so no sash for karen– but really? honestly? it’s for the best. sometimes I want to have something coherent and profound to say but just don’t. lately this blog seems to be doing a lot of skating along the surface of things– mostly pictures and media posts and not a lot of commentary. i should perhaps count this as a boon, as I well know how durned bogged down in words I can get. just that I find it odd, kind of unnatural, like some sort of holding pattern. well, maybe there’s a change afoot. isn’t there always a change afoot? a foot achange? step-ball-change. one change is that I’m trying to have less insomnia, because it is insalutary. except here I am, hello, awake. I blame navarone time. well, not really. I blame the cat and also the profound and irresistible appeal of the internet. and also the dog who seems to have figured out how to snow me into thinking he reeeeaaally needs to go out, even at 3 a.m. when apparently he doesn’t all that badly. sometimes it seems my life is one long series of distractions that don’t really amount to much. uh huh. like I said, sundayitis. the insomnia knows no time zones. beginning to suspect I may be operating on navarone time, which could substantially foul up my calculations for a certain device I’m contractually prohibited from discussing. likely as not, documented inconsistency of staircases in my “chicago” apartment building denotes a glitch in the matrix. meddling with the time-space continuum is no job for sissies. to do list, 3 a.m.
wash 5-6 loads at pirate laundromat (braving 100 yds of treacherous snow & ice) done! yeargh! refuse to look too hard at ongoing Life Questions done! do dishes and clean up spilled cat food done! fill up car’s gas tank at the cheaper station near work done! clean out disastrously untidy car not done– rather, rendered further disastrously untidy with basket of last-minute dried laundry– why indeed interfere with a good run of grunge? lay out clean towels for pet-sitting friend done! acquire time machine I am contractually bound to silence on this matter. Today: Abundant sunshine. High 54F. Winds W at 5 to 10 mph. Tonight: Mainly clear. Low around 35F. Winds S at 5 to 10 mph. sometimes it visits us at odd hours, in surprising guises, sneaking up and tapping us on the shoulder with its groucho marx glasses in place and whispering all sneaky-like into our ears while we’re in the midst of doing something totally silly and slapdash… but whenever wisdom deigns to sneak on through, I feel we should make space to acknowledge the grace of its passing. and so. on the tail end of my gazillionth round with insomnia and the latest cl experiment, I suddenly know this: there is no reason on earth that I should waste my good energy, angst or time on people who themselves make little or no effort. whew. the smartest things are damn obvious. and now, I’m going to make friends with my pillow for a few last minutes of darkness. ta ta for now.